Five members of a local high school sci-fi club, along with two female members of the photography club sweat away their summer days in their shared clubhouse. Although the air conditioner in their clubhouse is fully functional, it lacks any controls on the unit itself and can be controlled solely by an remote control. Unfortunately. one of the members broke the remote by spilling coke on it the previous day. The sci-fi club members decide to cool off at the local bath house and when they return they find an unusual person rummaging through their clubhouse, whom they later name “Mushroom.” Mushroom quickly leaves their clubhouse when the members walk in, but a very strange contraption is left behind. The contraption resembles a clunky version of the time traveling machine featured in the George Pal movie called The Time Machine. The sci-fi club members have a ball, joking about the odd looking machine until one of the guys decides to actually press the lever while sitting in the time machine chair. He disappears immediately, only to return a few moments later in complete shock. He tells his friends that he indeed traveled one day into the past. As the astonished geeks ponder the possibilities, somebody suggests traveling back in time to retrieve the remote control, prior to the time when the Coke was spilled. After their mission is started, some members that did not go back in time discovered that if anything is changed in the past it will irrevocably change the present and in particular, cause the object that incurs this contradiction of time to cease to exist. Faster then you can say “Back To The Future” the sci-fi club members, along with the help of Mushroom (who happens to have arrived from the future), travels back in time, to place things as they were, otherwise they may all cease to exist! Unfortunately things get more complicated due to unforeseen circumstances, as well as some major blunders by the sci-fi club members. KaiyaSam Jun 15 2012 1:55 am I really enjoyed this movie, and have watched it a few times already. Ki Jan 28 2011 8:53 pm Absolutely hilarious film, that is as funny as it is clever in its plot construction. The first 30 minutes of the film, a few inexplicable things occurred in the movie that I figured was caused by my inattention or perhaps the director using some type of unorthodox narrative structure. As the movie unfolded and the whole time traveling to the day prior occurred, everything started to makes sense from those beginning sequences. Once the first person goes back in time, the story gets exponentially more interesting, enhanced by the goofy mannerisms by the sci-fi club members, as well as the appearance of the cute as can be camera club girls. The film turns into a race against time, as the members work frenetically to place everything back to â€œnormalâ€ before that fateful coke is spilled on to the table . Almost like playing Rubik’s cube with a time limit of a say 90 minutes. The cast included many impressive performances, one would be by Juri Ueno, who was also in another very impressive film called "Swing Girls" (she played the saxophonist). 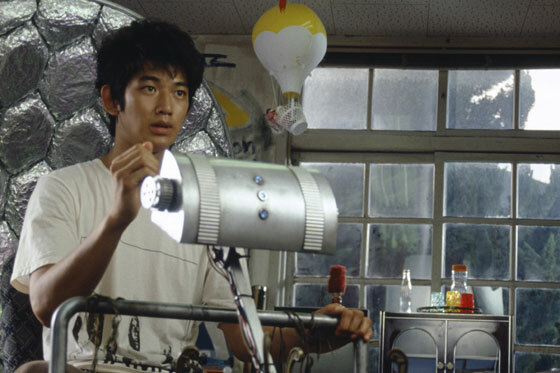 The way the geeky sci-fi club members interacted was definitely part of the charm of this film. 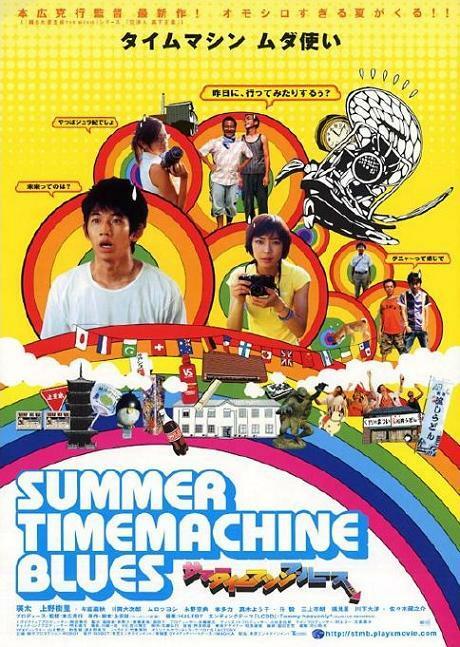 Summer Time Machine Blues has a seriously wicked plot and is a blast to experience. Highly recommended film that should appeal to anyone that watches the film.